A blog about genomics, data science, and analysis. Here is a tip for scientists that need to batch process NMR data quickly and uniformly for analysis. This approach could be a big time-saver in situations where you have a large series of 1D reference spectra collected by sample automation, for example. Or in NMR screening applications, where dozens of STD-NMR experiments are being collected during an overnight run. 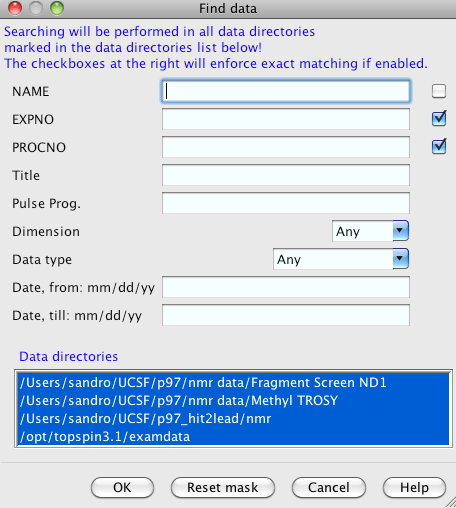 Since this is first time you are doing this operation, you need to select “find datasets” in order to first find the data to process. In the future, you will have a “list” created for you by the program that you can reuse to reference datasets in combinations that you specify. Under the “name” field, enter the name of the specific dataset directory you wish to search, or leave it blank to search across many directories. 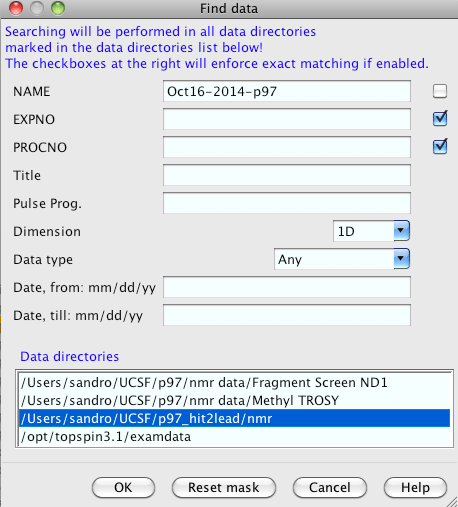 You can also match on experiment number (EXPNO) or process number (PROCNO). The check boxes enforce exact matching. You can select 1D or higher dimensional datasets for processing. You can also match by date. 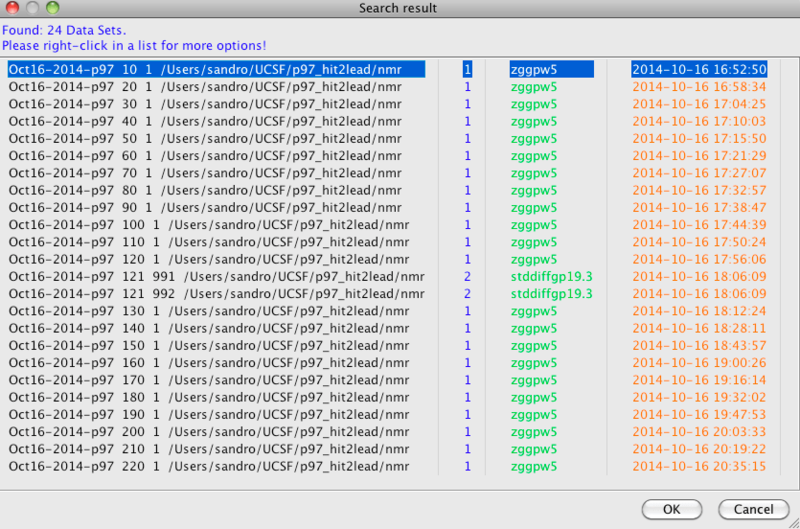 In this search, I am selecting for all 1D data contained in the “Oct16-2014-p97” subdirectory of my NMR data repository at “/Users/sandro/UCSF/p97_hit2lead/nmr”. This is where the useful, time-saving stuff happens. This dialogue takes the list you defined and applies whatever custom command sequence you would like to apply to your data. You define this sequence in the text box at the bottom. As you can see, I have chosen to perform “lb 1; em; ft; pk.” This is line broadening = 1, exponential multiplication, fourier transform, and phase correction. 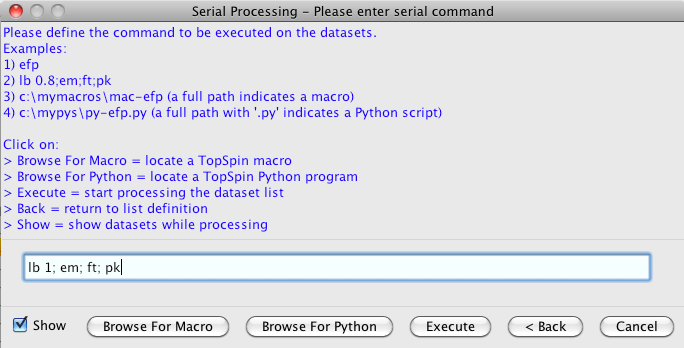 You can also specify a path to a python script for the Topspin API. Once you have your desired processing commands, click “Execute” and go grab a coffee! 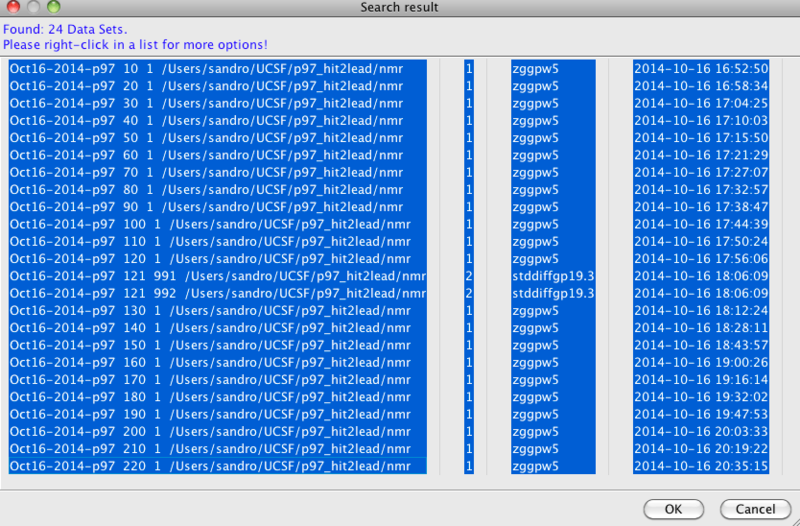 You just saved yourself many minutes of routine processing of NMR spectra. Hope you find this tip useful and that it can save you some time in your day. As therapeutic proteins gain importance alongside traditional small molecule drugs, there is increasing interest in using NMR methods to examine their structure, dynamics, and stability/aggregation in solution. Modern heteronuclear NMR of proteins relies on isotopically-labeled samples containing NMR active nuclei in the peptide backbone, sidechains, or both. Although isotopic-labeling of recombinant protein is typically carried out in E. Coli expression systems, many biotherapeutic proteins must be expressed in eukaryotic systems to insure proper folding and/or post-translational modifications. In practice, this means overexpression in either yeast, insect or mammalian cells. Increased interest in attaining labeled protein samples for analysis by NMR is leading to better commercial availability of isotopically-labeled expression media and improved vectors for overexpression in non-bacterial systems. Comprehensive reviews of state-of-the-art protocols and procedures for expression of isotopically-labeled proteins in non-standard systems are available here: yeast, insect cells, and mammalian cells. One way to make your life massively easier if you are doing NMR of small molecules, especially at low concentrations (sub-1mM), is to simply work out what buffer you’d like to use and then order all of the components in deuterated form ahead of time. For example, if you would like to study your molecule in a buffer like HEPES with 5% DMSO, you can order fully-deuterated HEPES and DMSO from companies like CIL and Sigma-ISOTEC. Although expensive, the time it can save you at the spectrometer and the enhanced quality of the data are likely worthwhile tradeoffs. You can also go a step further and prepare your buffers in 100% D2O, making water suppression vastly easier and improving the quality of your spectra. These steps work together in a synergistic manner to dramatically improve your data quality when acquiring on small molecules at low concentrations. Here is an important tip if you are setting up an automation run using Bruker’s ICON-NMR software. Before the run, lock and shim on your first sample. Once you have a very good shim, write your shim settings (‘wsh’) to a new shimset called “automation.” If you specify the “automation” shimset in the gradshim menu as the one to be used by ICON, it will use this shimset as a starting point for automated shimming before each sample rather than a default shim. Copyright © 2019 Michael S. Chimenti. All rights reserved.